A massive $1.5 billion plan to redevelop a string of formerly Navy-owned properties along the San Diego waterfront is finally entering into the construction phase following years of delays and decades’ worth of planning and environmental review. 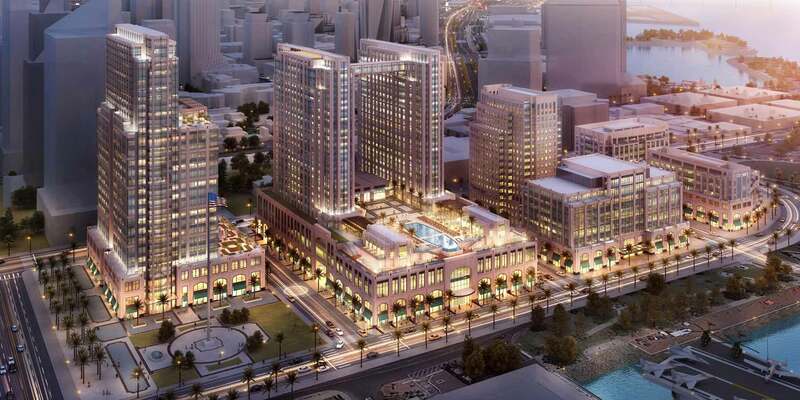 The so-called Manchester Pacific Gateway development developed by San Diego-based Manchester Financial Group will bring over 3 million square feet of mixed-use development and a 1.9-acre park to eight ocean-fronting city blocks in the San Diego’s downtown area. The multi-phase project will be anchored by a new Navy headquarters, to be housed in a new 17-story, 372,000-square-foot mixed-use tower located at the heart of the project. The tower complex will also include: a 1,100-room convention hotel, a 29-story, 524,000-square-foot office tower, an eight-story, 178,000-square-foot office building, a six-story, 153,000-square-foot office tower, 290,000 square feet of retail spaces, and a 260-key luxury hotel, the San Diego Union-Tribune reports. 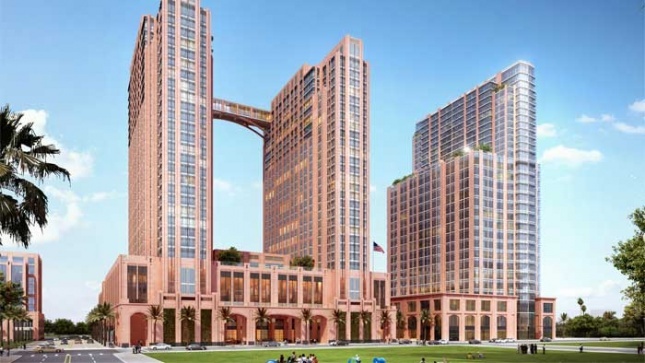 Renderings for the project depict a collection of traditionally-styled high-rises with arched storefront windows along the ground floors and repetitive spans of curtainwall glass interrupted by vertical and horizontal bands of masonry detailing on upper levels. One of the tower blocks will consist of a pair of linked towers that are connected via a skywalk while other structures in the complex will feature stepped-back facades and punched openings along certain exposures. The two largest building clusters feature four-story podium structures that anchor the towers located above, with both podium levels topped with terraces and garden amenities, including an elliptical swimming pool. A site-wide pedestrian spine will run across the length of the properties and will transform into an interior, retail-lined arcade when it bisects the largest structure in the complex. An architect has not been named for the project. Work on all phases of the Manchester Pacific Gateway project is to be undertaken simultaneously, with the new Navy headquarters and several of the office towers scheduled to be completed in late 2020. The remaining project components are slated for a mid-2021 debut. The project is among a long list of waterfront redvelopment efforts in San Diego, including another $1.5 billion development for the Port of San Diego aimed at tourists and a 41-story “super prime” luxury tower by Kohn Pedersen Fox.